Updated: We have updated the post at the end with links to their developer platform and other information. Due to fierce smartphone growth across the world, and especially in India, development of mobile apps and games has gone mainstream. We have now arrived at a scenario, where every major web application is available on mobile as well in form of an app. Infact, given the features smartphones offer, the app eco-system has expanded much beyond that! App stores from iOS and Android have millions of app available for their phones. But one issue has constantly plagued mobile app developers in country like India – It is the mobile payment mechanism. Given the extremely low percentage of credit card users in India, apps that are paid or have in-app purchases do not do well, making it un-feasible for app developers to invest too much of money in app development. Companies across the world as well as telecom operators understand this problem. Operator billing is now slowly taking hold. Recently, Fortumo started offering operator billing to app developers with some of the major Indian telecom operators. Citing this issue, Vodafone India today announced launch of a unique developer platform that will allow an easy plug and play eco-system for app developers and content service providers. This platform will allow developers to easily integrate operator billing on their apps on Vodafone network. 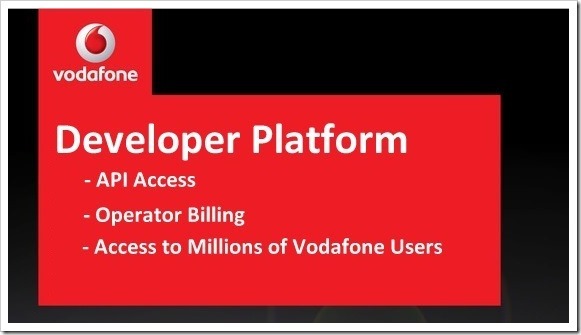 The Vodafone Developer Platform opens up Vodafone network resources (known and API in technical parlance) like subscriber profile, billing, location, messaging etc. for the app developers and content providers to build their offerings. Developers will also be provided with a robust facility to test their apps and services in a simulated environment. Developers interested in using the platform will need need to sign standard set of terms and conditions, which will govern the commercial and others aspects of the developers relationship with Vodafone India. Mobile apps build with Vodafone developer platform will allow millions of Vodafone customers to make payment for the App or any in-app purchases easily using their mobile phone. The amount will reflect in their bills for postpaid customers or will get deducted from balance incase of pre-paid customers. While Vodafone has become to the first to launch such a platform, we are pretty sure other telecom operators will soon join the fray! The press release sent to us did not give any indication on what percentage of fee will Vodafone charge neither have they provided a link from where we could get more information on the same. We will update this post when we have further information on the same. Update: You can find all details about the Vodafone Developer platform by visiting . The platform allows apps on all different iOses to be uploaded, tested and published. Do give it a try and let us know your experience.